Look around your home. How many devices connected to the internet do you see? When you bought them did you have a grand plan? People often buy smart home products ad hoc: install a thermostat here, buy a smart speaker there. But now that smart home technology is becoming more prevalent, we should be building homes around that smart home technology, so that all products can work together to make living in your home simpler. Today, we're partnering with KB Home to make that happen. 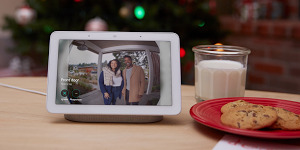 KB Home is one of the largest home-builders in the U.S. and now, new homes in select KB Home communities in Jacksonville, Las Vegas, Denver and Orange County will include a Google Home, Google Home Mini, Google Wifi, and a Nest Hello video doorbell. Additional connected products, such as smart appliances, can also be incorporated in the KB Home Design Studio. KB Home shares our vision to make homes more efficient and simple—and Google and Nest products can help.